Stainless Steel Balustrade and Stair Handrail Supply | Dah Shi Metal Industrial Co., Ltd. - Dah Shi Metal Industrial Co., Ltd.
With over 1,000 molds available and 40 years of experience, Dah Shi Metal Industrial Co., Ltd. (Dah Shi) offers low cost handrail fittings along with innovative designs and continues to gain visibility from international buyers. 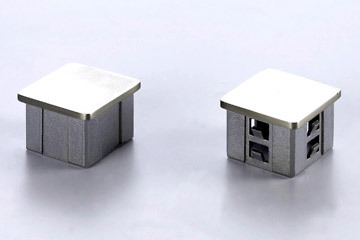 Regardless square or round balustrades, handrail fittings for walls, stair rail bases, stair rail elbows, end caps or joiners, all of them are built to meet Japanese, Western and European international standard sizes. At Dah Shi, all railing components are made of stainless steel, which is popular and 100% recyclable. A stylish stair railing design without an experienced manufacturer to deliver proper solutions can end up being costly, since there are various machining requirements, including lost wax casting, cold forging, metal sheet forming, punching, welding, bending, etc. Choosing suitable manufacturing solutions is critical and Dah Shi is good at it. 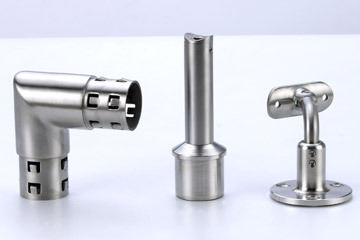 Dah Shi is capable of providing one-stop production, it means each handrail fitting component is designed, manufactured and tested rigorously to enforce its size accuracy and quality. At Dah Shi, there is coiling, pounding and pressing machine (hydraulic high speed punching machine and press machine) for stainless steel sheets, pipe bending machines for tubes and pipes; CNC, shaping and automatic lathe machines for lost-wax casting's workpieces. Pounding, topping, drilling, electric welding, argon spot welding, polishing and assembling are conducted once stainless steel handrail and balustrade components are made. Ultrasonic auto clean machine, powder electrostatic coating and grinding machine are accessible as well. Dah Shi's railing accessories are installed worldwide, they are on the boat, in the park, at the airport or school, in the office tower, etc. And also because of their seasoned experience, they have strong ability to deliver custom handrails to meet your high expectations. Stainless steel handrail and balustrade components made by Dah Shi. Flexible in design and style. If you are looking for trustworthiness and only high quality handrail fittings, look no further than Dah Shi. "At Dah Shi, modern, stylish and cost effective handrail fittings are designed based on over 40 years' of experience in order to achieve your goals," said Rebecca Lee, the design manager of Dah Shi. Team of dedicated professionals at Dah Shi work closely together with their customers from the design stage through final qualification ensuring that both the die and final product meets all of their requirements. The handrail accessory designers work with their die makers throughout the design and fabrication of the die using the latest industry standard software. 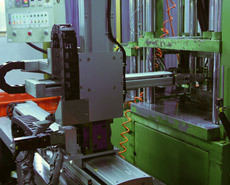 The Computer-Aided-Manufacturing (CAM) is capable to read data files and generates complex molds efficiently assists in providing accurate, low cost injection molds. 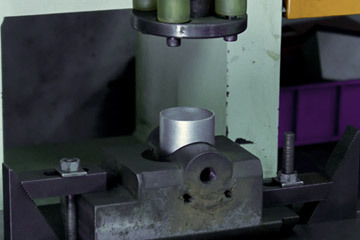 Our engineers help to determine the cast-ability of the handrail fitting design, and suggestions may be made to improve casting design or performance. 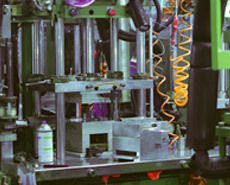 The engineers are also fully conversant with production processes, and their presence in the factories provides continual support during production. No matter what your source drawing is, our engineer can transform your drawing to solid model. This solid drawing enables you to see the final profile of stainless steel railing accessories. 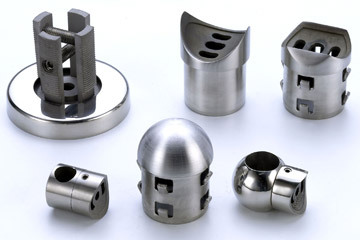 Wax replicas of the desired castings are produced by injection moulding using a metal die. 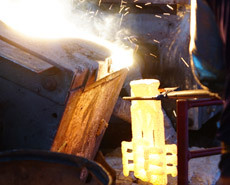 Melted wax is injected into the die, creating an exact wax replica of the part. One wax pattern must be injected for every finished part. In the case of a prototype, a heat disposable pattern is generated using a CAD file. 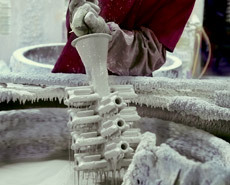 The casting process begins by production a wax pattern employing a precision mold. The wax patterns are fastened by the gate to a runner to form a cluster. 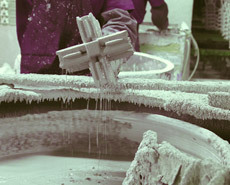 The cluster is dipped in refractory slurry and coated with fine sand then dried. 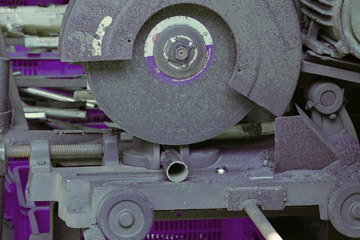 The process of dipping and drying is repeated until a robust thickness is achieved. After this, the ceramic shell is heated, and the wax is melted away. These patterns are attached via a "gate" to a central wax stick, referred to as a "tree" or "sprue", to form a casting cluster or assembly, and mounted on a pouring cup. A shell is built by immersing the assembly in a liquid ceramic slurry and then into a bed of extremely fine sand. Several layers may be applied in this manner. 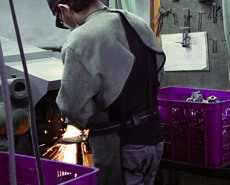 The process of dipping and drying is repeated until a robust thickness is achieved. After this, the ceramic shell is heated, and the wax is melted away. 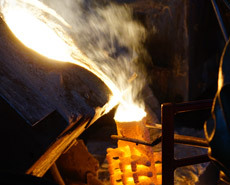 This leads the mold into a cavity that can be filled with the molten metal. 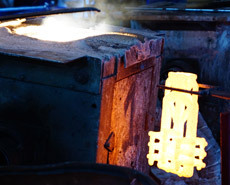 The hollow mold is fired, and the liquid alloy is poured into the pre-heated mold. After the metal has solidified, the slurry shell is broken off and the individual part is cut away from the connecting gates. 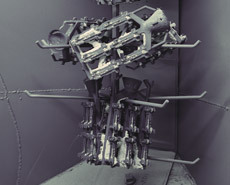 The parts are cleaned and subjected to further secondary operations. 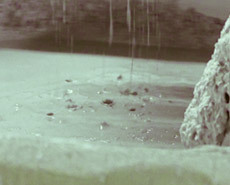 The shell is filled with molten metal using various techniques and, as the metal cools, the parts, gates, tree and pouring cup become a solid casting. 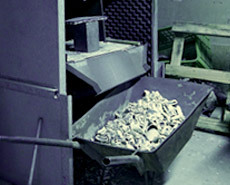 When the metal has cooled and solidified, the ceramic shell is broken off by vibration or water blasting. 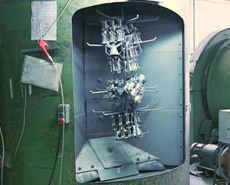 A metal melt casting apparatus comprises a vessel for containing the melt and having a wall portion having a downwardly pointing melt tapping hole, the vessel tilting so that this wall portion can be raised and lowered. 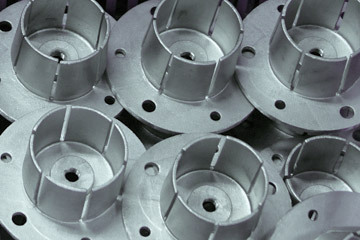 A fountain has a top for receiving the melt when registered with said tapping hole and a bottom for connection with the bottom of a mold. A gas-tight elastically deflectible sealing means interconnects the tapping hole and the fountain top when the mentioned wall portion is lowered thereon by tilting of the vessel. The sealing means is made in the form of two parts which elastically flexibly engage when the converter wall with the tapping hole is lowered on the top of the fountain, one part being connected to the wall and the other part being connected to the fountain. The sealing means is provided with a gas passage so that the tapping metal stream may be subject to evacuation for degassing or surrounded by an inert gas. The parts are cut away from the central tree using a high speed friction saw. Check out railing accessories: rail elbows, stainless flanges, rail adapters, ball fittings, slip on fittings, flush fittings, rail end caps, square fittings and rail brackets, etc. Welcome to Dah Shi Metal Industrial Co., Ltd.
Click on - "Contact Us" to write down your needs we'll respond soon!